Columbia, Mo. (Dec. 4, 2018) — The Missouri School of Journalism will celebrate the 50th anniversary of its Washington, D.C. program on Dec 5. The celebration will take place at the National Press Building. The event is expected to be well attended by alumni of the program and media leaders. The Washington, D.C. program, which was started in 1968 by Professor Emeritus Edmund Lambeth, provides students with an opportunity to practice reporting, public relations and advertising in the nation’s capital. Fritz Cropp, associate dean of Global Programs, says it is important to celebrate the half-a-century of accomplishments. Boasting hundreds of alumni, the Missouri School of Journalism Washington, D.C. program has been giving graduate and undergraduate students hands-on experience contributing to the largest press corps in the country since 1968. In its earlier years, the program involved only graduate students and provided opportunities primarily for news reporting. Today, the program places University of Missouri graduate and undergraduate students in the nation’s top newsrooms and top-notch advertising and public relations firms. The Washington, D.C. program has yielded great success and boasts hundreds of alumni. Jeff Leen, the Washington Post‘s head of investigative reporting, and Soo Rin Kim, investigative reporter at ABC News, will speak to the group at the Dec. 5 event. Professor Emeritus Steve Weinberg, who served as the second director of the program, says the program sets University of Missouri graduates apart from other young journalists. Lambeth and Weinberg were the first two leaders who guided students through the program. They were followed by Dean Roy Fisher (1983-1989), Associate Professor Emeritus Wes Pippert (1989-2012) and Professor and Curtis B. Hurley Chair in Public Affairs Reporting Barbara Cochran (2012-present). As the program has made its mark on the D.C. media scene, Cochran says it will continue to be a staple to ensure students are well equipped for the professional world. Register to Attend: 50th Anniversary of Missouri School of Journalism’s Washington Program. 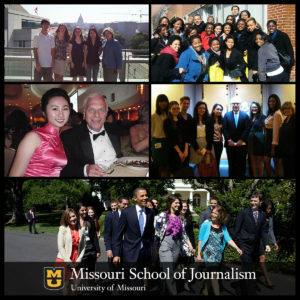 May 4, 2010: 10 Missouri Journalism Students Recognized at Annual White House Correspondents' Dinner in Washington, D.C.